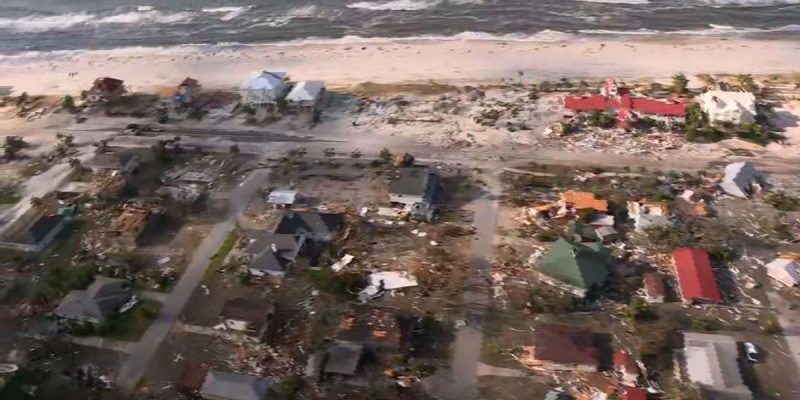 What follows below is helicopter footage of Mexico Beach, Florida, just southeast of Panama City Beach, in the aftermath of Hurricane Michael scoring a direct hit on the tiny seaside community of what was 1,190 people. That population is likely going to decline quite a bit for the time being. Mexico Beach, which was subjected to Category 4 winds of up to 155 mph and what was reportedly a nine-foot storm surge, barely has a building left intact after incurring Michael’s wrath. From a helicopter, you can see that many of the homes and hotels that populated this beachside town of about 1,200 are gone. A few houses and other structures remain standing, but they’re the exceptions. Mexico Beach will recover. That’s assured. The beach there is too pretty not to. But the recovery is going to make the place look much different than it was before Michael came through. Those cottages will be replaced with high-rise condos, because it’s a high-rise condominium which can survive the kind of wind and water a major hurricane brings – and the insurance industry is going to be loath to underwrite coverage for a house which can be a total loss in a storm like Michael. Real estate developers will descend on Mexico Beach soon with checks in hand. That will make for an interesting, if painful, next few years. For now, at least we can be thankful the loss of life was minimal from such a monster storm.